I say “well worn” because if you’ve ever purchased Vera Bradley before, you know these items last and last! We have a baby diaper bag that we’ve had for 12 years now. Amazingly, my daughter now uses it as her overnight bag. It has held up so well, that once I found a sale, I didn’t hesitate when our daughter asked for a Vera Bradley lunch box and book bag. Even though the prices are high initially, with these sales and free shipping as well, these quality items can be purchased for a steal. 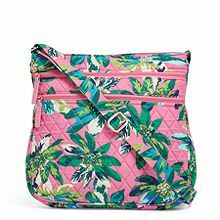 We found some steals at Vera Bradley’s outlet, like this triple zip hipster. Clearanced down to $24 (originally $68), plus additional 30% off and free shipping makes it about $17! 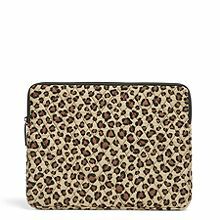 Or this leopard print 13″ tablet sleeve, regularly $38, marked down to $11.50. With additional 30% off, it’s only about $8! You can’t beat these deals. These would also make great teacher, graduation, birthday, and mother’s day gifts! We have a selection of our Mom’s Priority online shopping platform devoted to Vera Bradley items; we love them that much! After checking out the outlet, you should head over to our online platform and browse around. The patterns and quality materials Vera Bradley uses makes these bags great for school, work, travel, and more. Don’t miss this Vera Bradley Outlet sale, going on today through Wednesday. Over 300 items are clearance down on the outlet, so shop now for best selection and availability. Click here Online Outlet Exclusive: Take an extra 30% off already-reduced prices, plus free shipping! Only at outlet.verabradley.com. Valid 3/17-3/20. For more deals from other inspiring companies like Vera Bradley, check out our deals page.